For someone who loves old-fashioned, slow things like knitting and spinning and weaving, I sure do love gadgets. So I guess it shouldn’t have come as a surprise that I would fall in love with a kitchen gadget. I just really wasn’t prepared for how very hard I would fall. Twenty years ago, I dated a guy who loved to cook and specifically loved cooking in a stovetop pressure cooker. He persuaded me to get one, and I did. But I was always so scared of that thing that I probably used it less than a dozen times over the years. But the electric pressure cooker takes away that fear for me, because it takes away the risk. It also takes away the guesswork. I was attracted to this particular electric pressure cooker because it’s a 7-in-1 gadget- it works as a pressure cooker, slow cooker, rice cooker, food warmer, yogurt maker, and it sautés and steams. But here is my confession. For the first six months of owning this beautiful baby, I only ever used it to make yogurt. There were two reasons for that. One: I was intimidated by all the functions and options on the machine. Two: the yogurt is amazing. I started eating yogurt again (after years of reducing and occasionally eliminating all dairy) last winter, after a really nasty stomach bug. When I was getting back on solid foods, there wasn’t much that appealed to me. Then I suddenly had a deep, undeniable craving for Greek yogurt – thick, plain, whole milk yogurt (I believe in eating fat). I had some raw, local honey from my stepson and his fiancé (they raise bees) that I stirred in, along with some raw nuts. It was total bliss, and I was hooked. pour in the milk, lock the lid, hit the Yogurt button, and the pot brings the milk to boil. It beeps when it’s ready. Take off the lid, turn off the machine, let the milk cool to 115F or below (this is the hardest part of the whole process). Stir in yogurt starter (I use Fage Total yogurt or some of my previous batch of yogurt). It needs a lot less starter than you might think. I stir in 1 Tbsp per quart (and I usually start with half a gallon of milk and so stir in 2 T yogurt). Put the lid back on, hit the Yogurt button again, and adjust the time (I usually do about 10 hours, but it can be as few as 8 or closer to 12 – I just set it depending on what else is going on with me that day). When the timer goes off again, you have yogurt. It can go straight into containers in the fridge to chill at that point. But since I like Greek-style yogurt, I always strain mine first. I pour it into a strainer lined with a clean cotton tea towel, set over a large bowl. I then set the whole thing in the fridge for 2-4 hours, which makes for a very thick, very creamy yogurt (and a good amount of whey, which can be used for many other purposes). It is SO GOOD, y’all. And since it’s plain, everyone in the family can stir in whatever they like (or leave it as is). I like mine with honey, almonds, and fresh berries. As delicious as this yogurt is, and as unbelievably easy as it is to make, I decided over the holidays that it was high time I started using the Instant Pot for over things, too. So I joined this amazing Facebook group dedicated to the Instant Pot, and it has been really educational and inspiring. My gal Heather and I text about our Instant Pots all the time, and she’s been encouraging and helpful, too. So I finally took the plunge and went beyond making yogurt. And I have been ALL IN. In the last 11 days, I’ve made Buffalo Wings, Kalua Pig, Chili, Vanilla Custard, Mocha-Rubbed Pot Roast (a dish I usually make in the slow cooker but was even better in the Instant Pot; actually the same could be said about the Kalua Pig), Mexican Beef ( AMAZING), Crispy Chicken Breasts with Lemon and Capers, Potato Soup, and absolutely perfect easy-peel boiled eggs (twice). 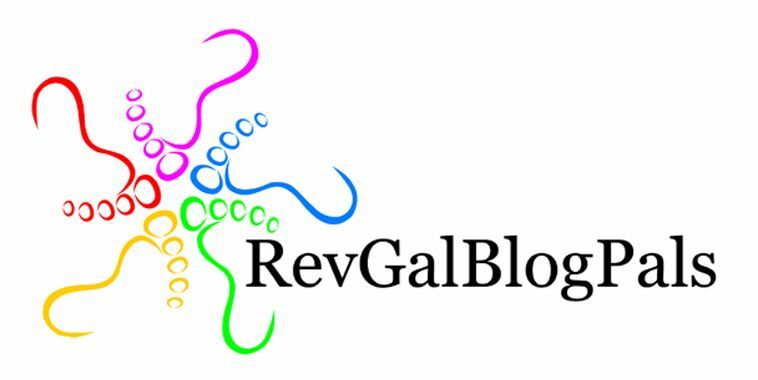 (I will try to come back and add links to all of those when I have a minute – this post is already getting out of control! ).And of course, I’ve also made more yogurt. My mind is hopping all the time now with Instant Pot ideas, so I figured I might as well subject all of you to it, too. I’m probably going to need to write up some of my ideas and experiments, too, so consider this fair warning – you may have to see many more I Love My Instant Pot posts. 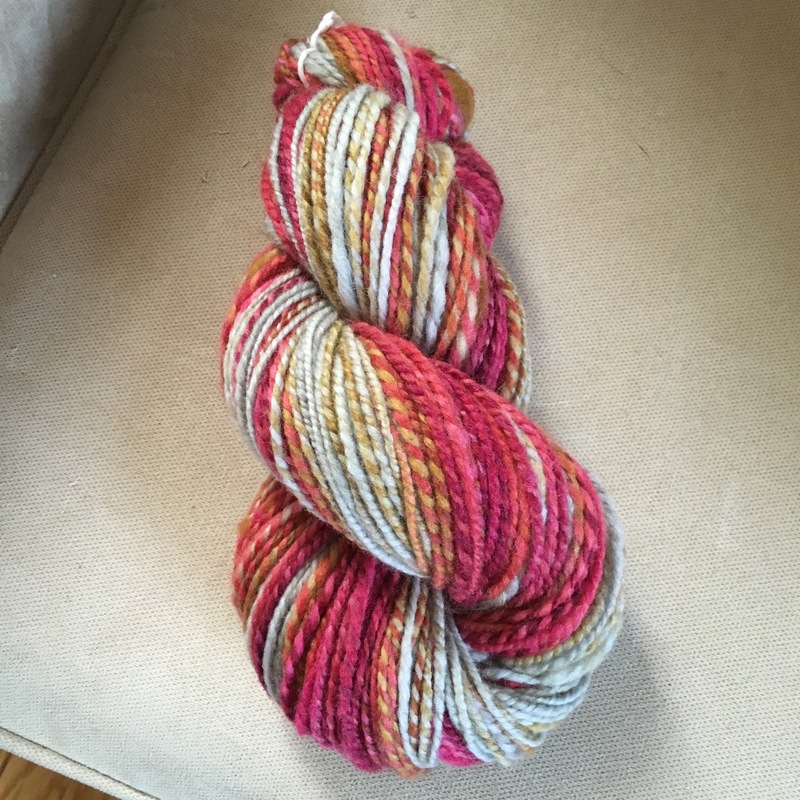 Hello Yarn “Blossom” on Finn – my first spin of 2016 – 3.5oz, 252yds 2-ply DK. 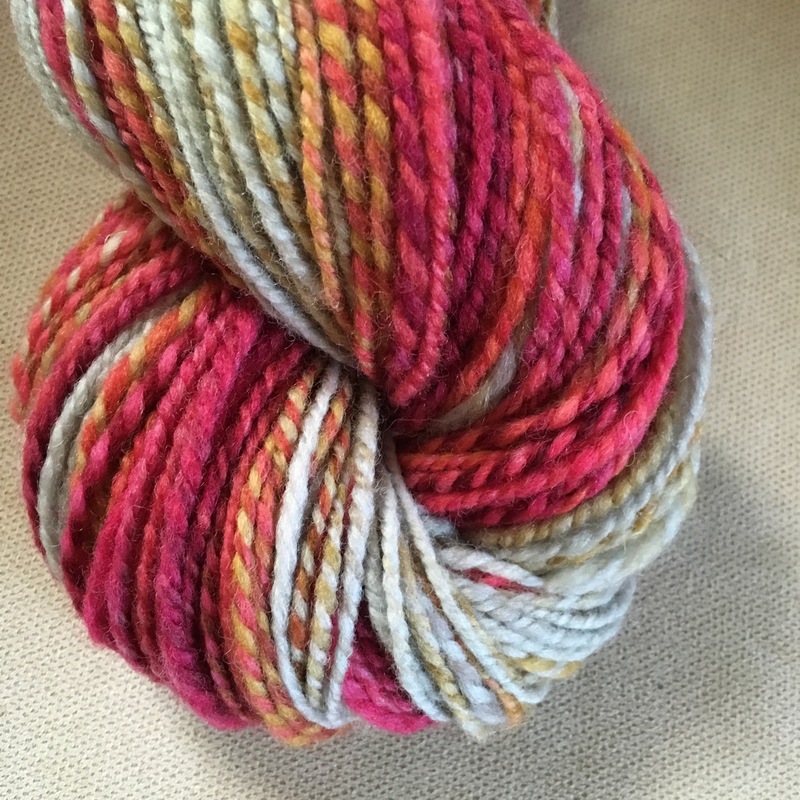 Love this bright, happy yarn on these cold, grey days! Two weeks into the new year (can I still call this year “new”? ), and I’m already behind. I spent the first several days sick, and the next several trying to catch up from having been sick, and I’m still trying to recover my knitting mojo (not to mention finishing up the photographing and logging of my 2015 knits). It’s been a little demoralizing. 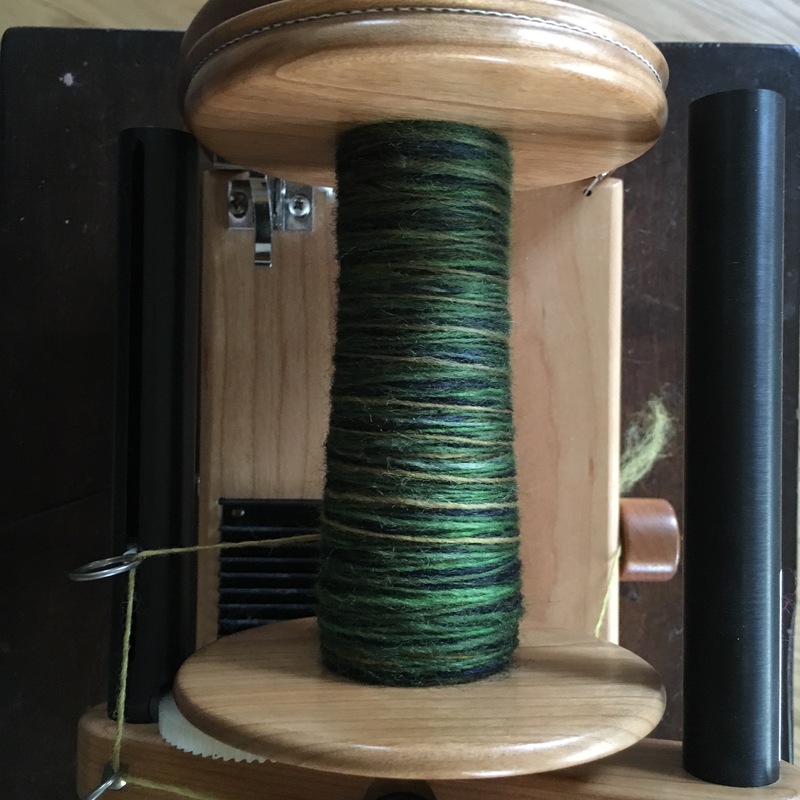 That right there represents the most I’ve ever spun in a single year – just shy of seven pounds. This was in large part due to getting an electric spinner (a Hansen miniSpinner) for my birthday in June. The first seven yarns I spun this year happened over a period of five months, on my Ladybug. The next 20 happened over the next seven months, on my miniSpinner. I am sad to say that my Cherry Matchless has seen no action at all this year, and she is in a high sulk. I need to make some decisions about her this year. The miniSpinner has completely revolutionized my spinning, and I’m just not sure I need two wheels on top of the spinner. I’ve always adored treadling, but the truth is, I’ve done no treading since June. It’s hard to justify keeping my Matchless under the circumstances, but it’s also hard to consider letting go of such a beauty. So … we’ll see. 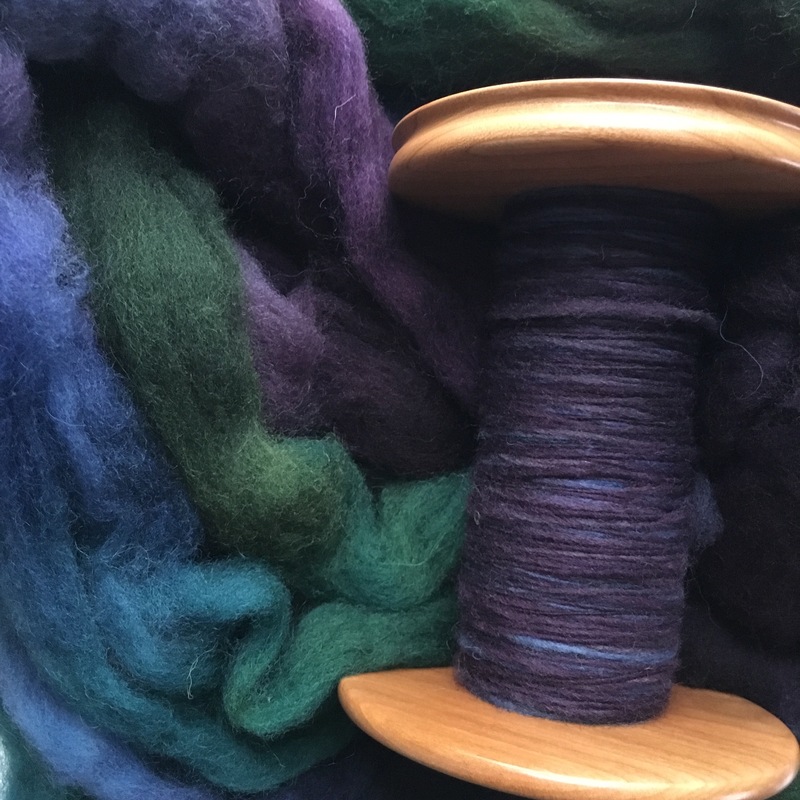 Meanwhile, I’m in love with spinning these days and am hopeful that I can maybe spin around 10 pounds this year, while honing my technique. 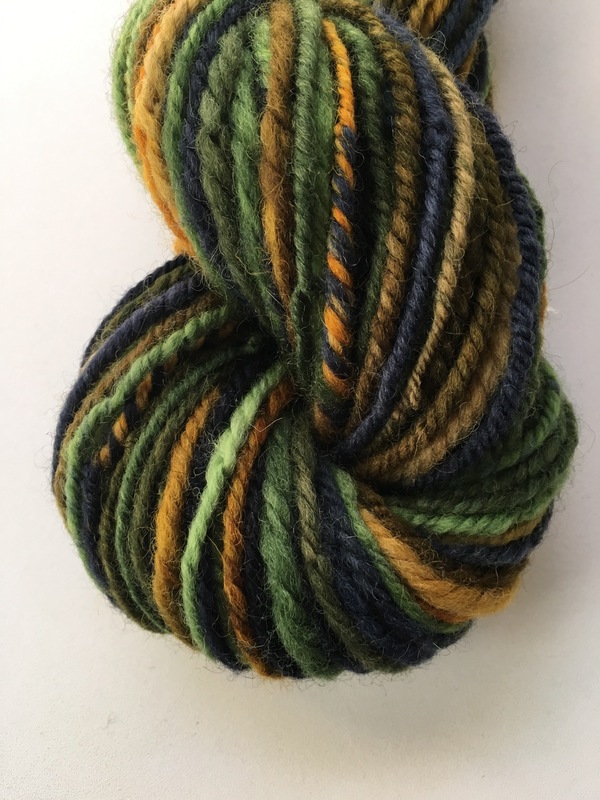 Even after almost seven years of spinning, it still always amazes me that I can make yarn with my own two hands (and a tool of some sort). Such a deep and simple pleasure, and one of the brightest spots of 2015 for me. 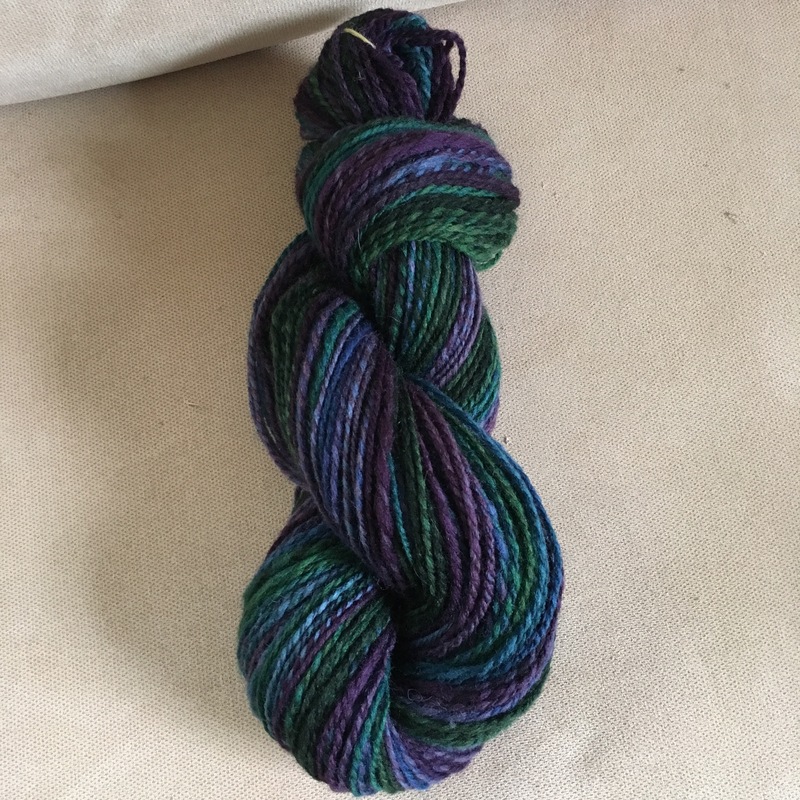 At the end of the year, I finished up my third (and final) spin for the Winter is Coming Spinalong (in the Southern Cross Fibre Ravelry group). 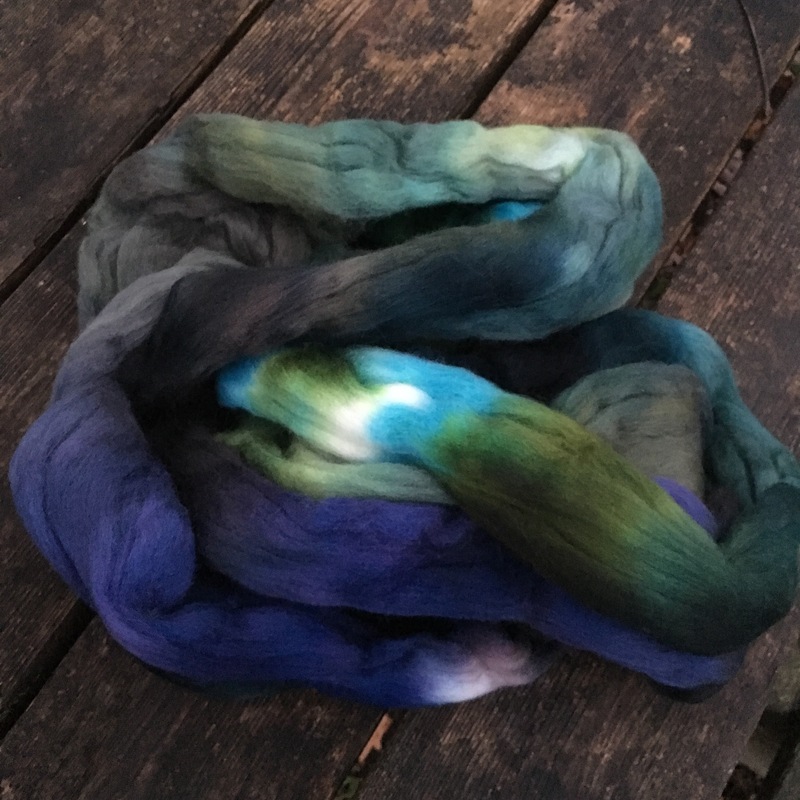 Considering themes and images as inspiration for my spinning is a new way of doing things for me, and I’ve really enjoyed it. 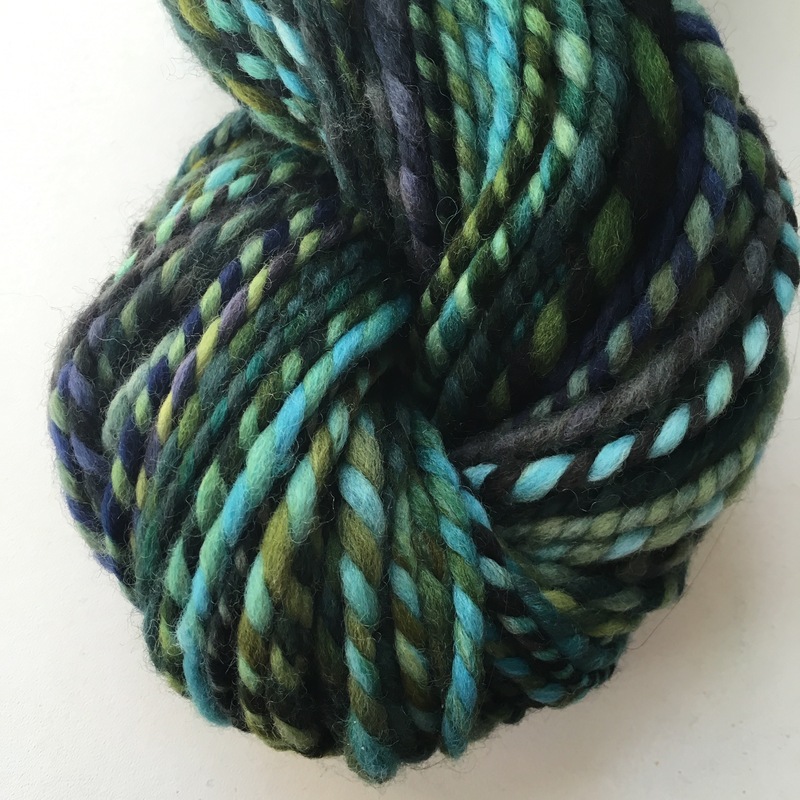 I absolutely adore this colorway – so deep and rich. 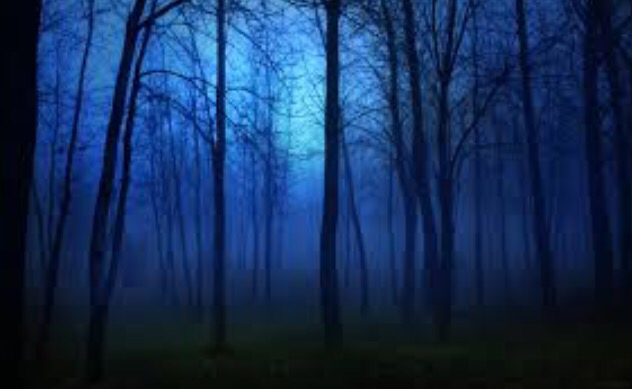 Initially, I thought of its resonance with winter fires, or with red Christmas decorations, but in the end, I was drawn to something altogether different. It was an icon of the Annunciation – Gabriel’s visitation to Mary – a story I get to read at our church’s Christmas Eve service every year. I loved the particular depiction I found (which I won’t post here because I don’t own the rights to it), because Mary is holding yarn. It’s red yarn. In some icons, she is depicted as spinning (and, in at least one, even knitting). In this one, she has dropped her yarn to listen to the angel. What’s more, she’s also wearing red socks. Okay, maybe they are shoes. But I like to imagine that they are socks. I also like to imagine that they are handknit handspun socks, that she made for herself. The deep red really enchants me. 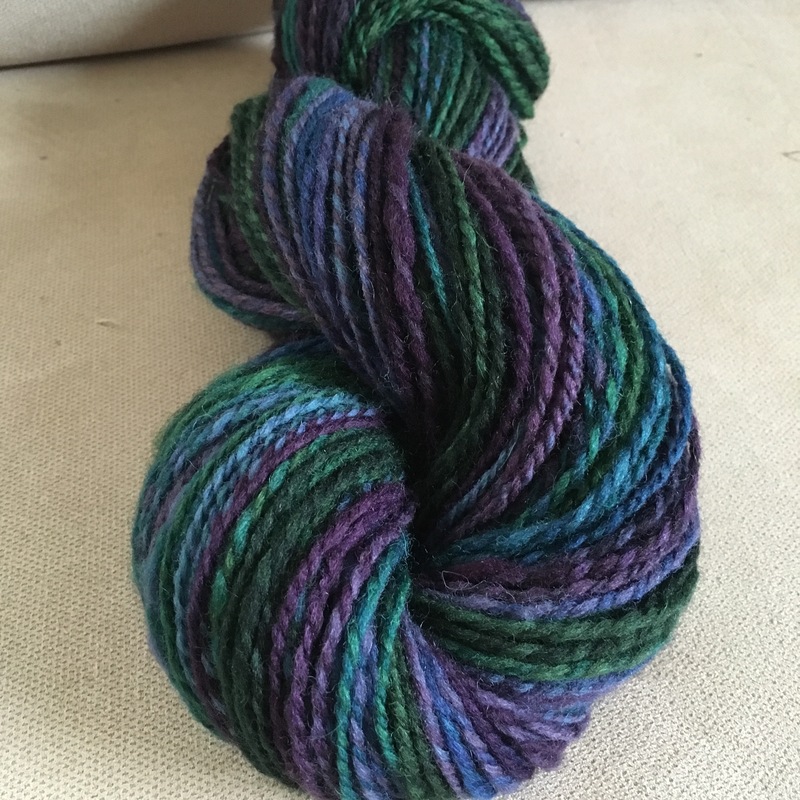 I wanted some for myself, so I spun up the yarn. 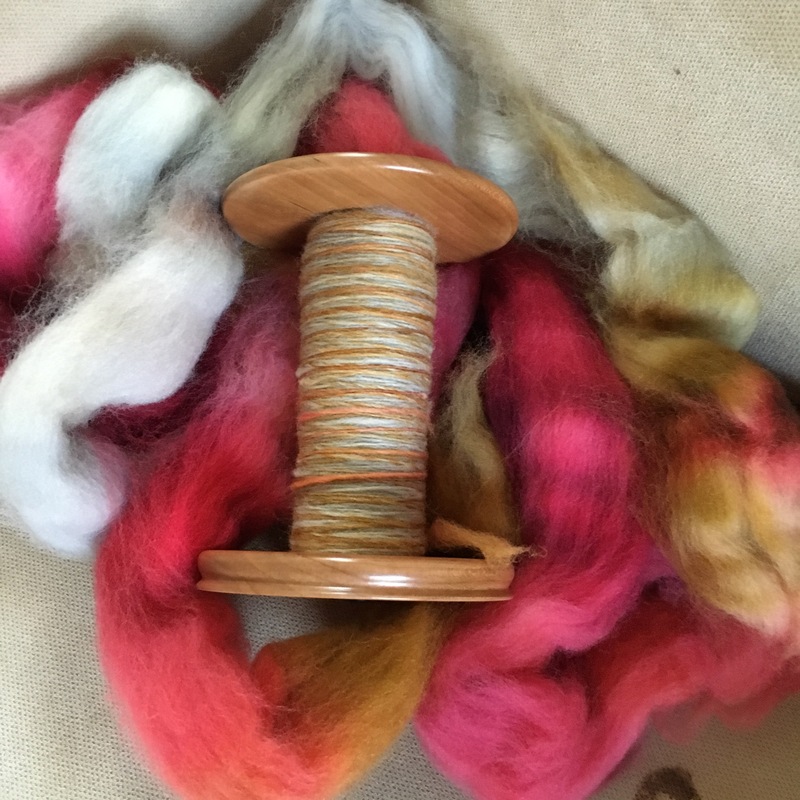 The spinning itself was a total delight. The chain-plying was another story entirely. I’ve been having trouble with my chain-plying lately, and I don’t know what the problem is. I ended up with more twist and less yardage than I’d hoped. 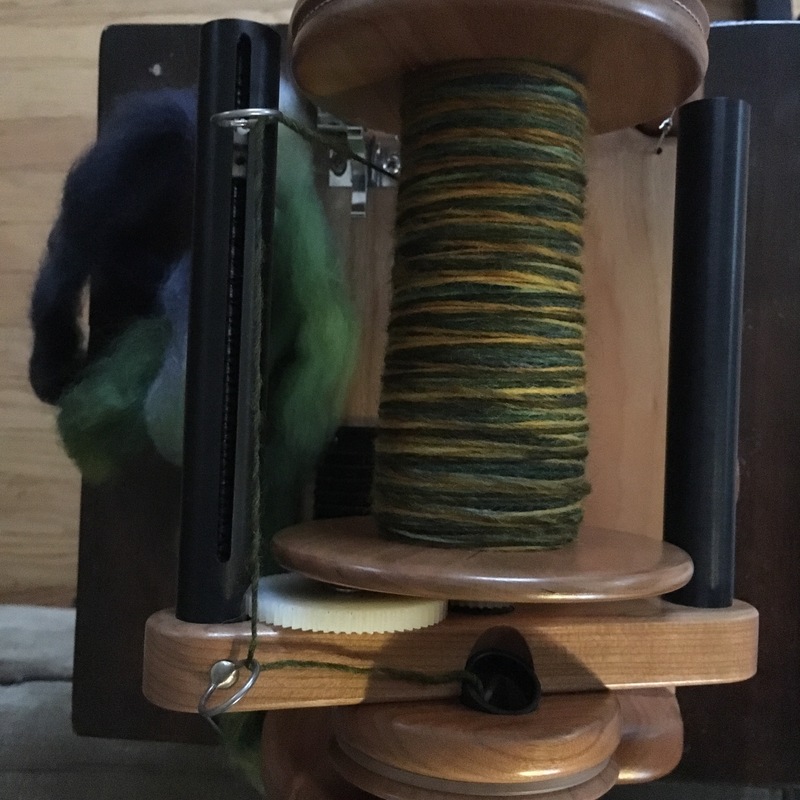 I actually ran it back through the spinner to take out some of the twist, and that helped (though it didn’t increase the yardage, of course). 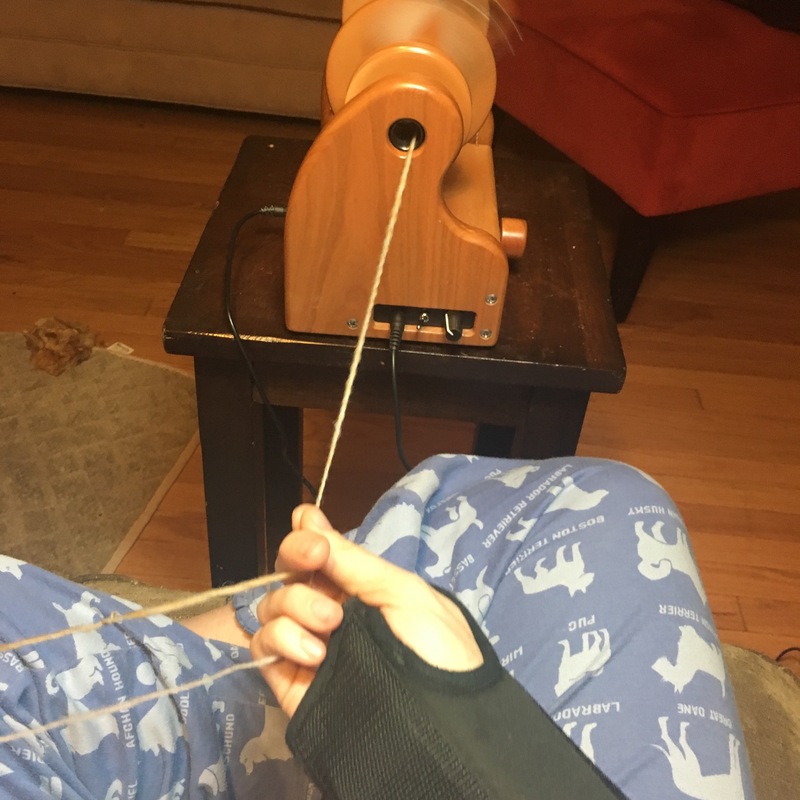 I think I need to go back to one of my wheels for chain-plying, because I do believe that part of the issue is my electric spinner tempts me to go faster than is wise. That works fine for regular plying, but not for chain-plying. But even on the wheel, I struggle with consistency in my chain-plies. I am very, very interested in hearing any words of wisdom from those who have this process a little more down pat. What advice would you give me? 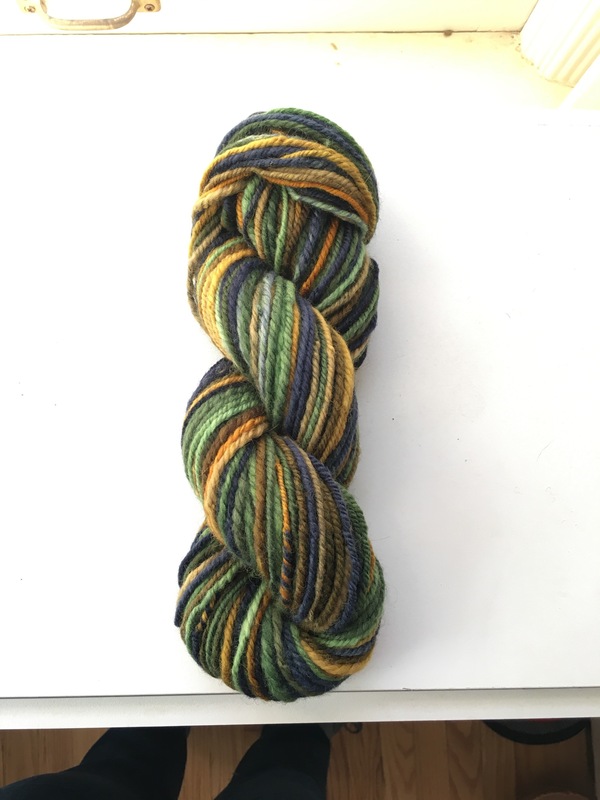 Even with my plying issues, it’s hard for me not to love this yarn. The color is so deep and luscious (which I didn’t capture very well in these photographs). I’m looking forward to knitting it up! 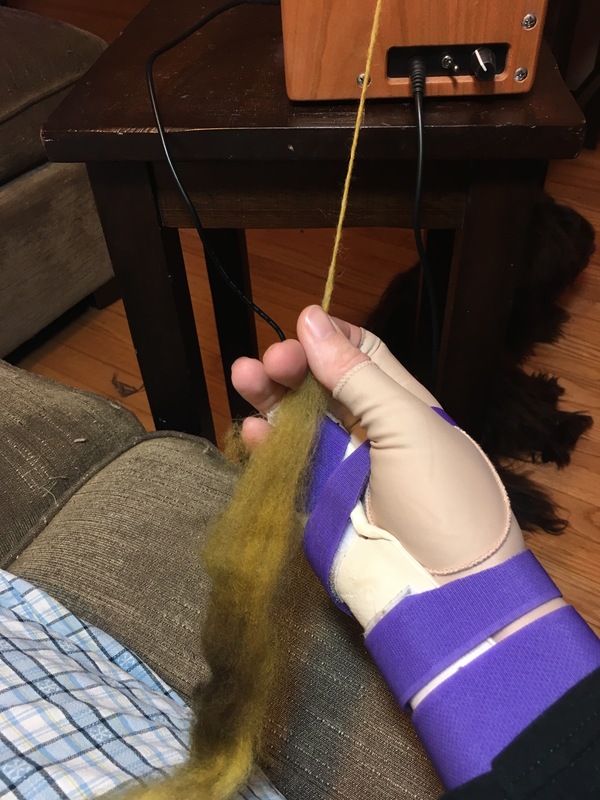 It’s a long, stupid story, but the upshot is I messed up my hand and I’m in a splint and a lot of things hurt, including knitting. I’m seeing the orthopedist in the morning, and I hope to know more then. But tonight, I’ll just keep spinning…. Sundays are so full and busy for me, in a good way, but it means they spin away from me so quickly. Today is spinning by especially fast. But I’m helped by the fact that I started the day by doing all the things that ground me, including some spinning. 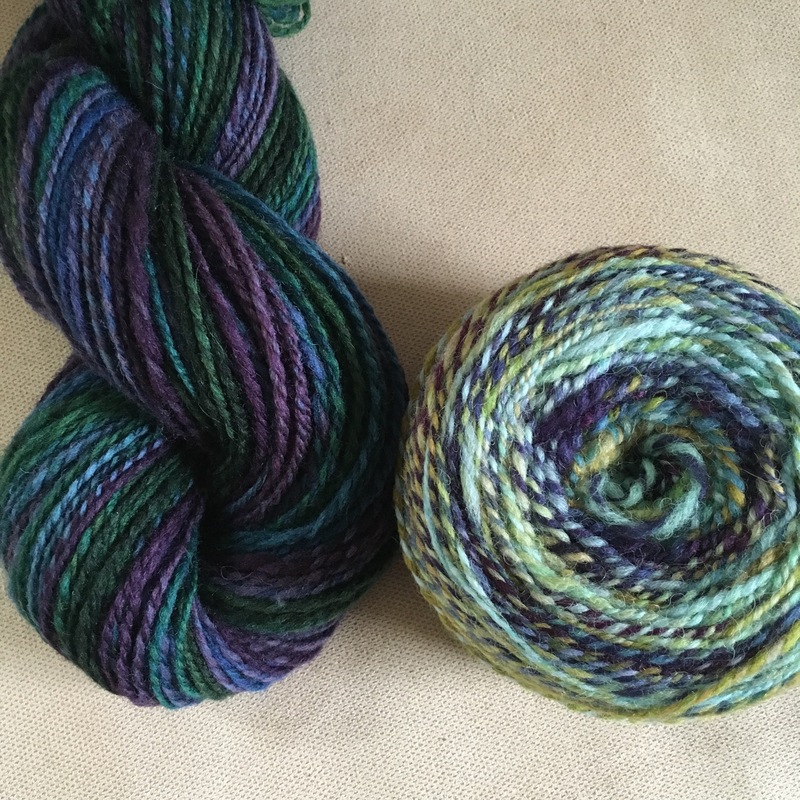 Finished the first two ounces of Hello Yarn Falkland, “Mignardises” (June 2014 fiber club). I love it and plan to make a little time for more spinning tonight. I hope your Sunday is beautiful, and that you are able to make a little time for whatever fills you with joy.